Leviton Security & Automation complete product offering as well as general company information and helpful charts/diagrams. 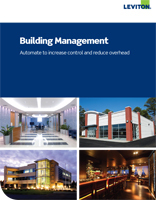 This document is ideal for Leviton representatives, dealers, distributors, and more. You've patiently waited while we ironed everything out, and now we present the most concise, attractive, and targeted messaging to date. OmniTouch 7 is on Fire! The OmniTouch 7 Touchscreen has received a lot of attention this month! CEPro magazine gives the OT 7 a nod; as does the Home Controls Blog. Residential Systems magazine heavily featured the product in their Integration Guide to Touchpanels. Touchscreens will be shipping this month. HGTV.com discusses Climate Control Systems: "Leviton, for example, lets you control up to 64 different thermostats from one app. You could also tie your HVAC into a home-automation system, which means less futzing with thermostats and more automated functionality. When you are ready for bed, just pick up your phone and press the "Go to Sleep" button, and thermostats — among other devices — are set to predetermined levels, saving energy while you slumber." See You in Booth 1729 @ CEDIA! Welcome Patrick Donnelly to Leviton Security & Automation! Patrick is an electrical engineer and a seasoned veteran in the industry, previously instrumental in sales and training efforts for several home technology companies. He will help ramp up our award-winning training efforts and ensure you don't have to travel to New Orleans to get quality hands-on factory education. Leviton's International Customer Support Manager, Jay Correa, will give two presentations on the DALI module for Leviton's Omni-Bus lighting control network. 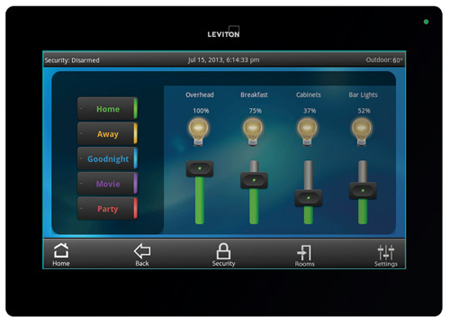 Want to learn more about Leviton Security & Automation? Attend our two-day hands-on training course in New Orleans, LA. We'll walk you through setting up an entire system with installation and programming as the focus. Get all the technical knowledge direct from our seasoned installer and trainer, Harold Lester. 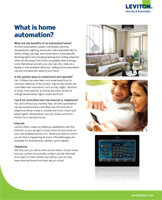 Perfect for a homeowner’s initial introduction to home automation, the new "What is Home Automation?" document is available online and will soon be available for free order of hard-copies. Want to attend CEDIA 2013 for free? Join us September 25th-28th in Denver Colorado in Booth 1729. Attend our training seminars while you're there! View the PDF to get your coupon code. Yesterday, Leviton Security & Automation sent our distributors and dealers information on an exciting upcoming product, the OmniTouch 7 Touchscreen. The OmniTouch 7 is anticipated to ship during August 2013 with better technology, faster processing power, and upgraded graphics. Featuring a 7" high-definition capacitive touch with swipe abilities, the latest advancement in Leviton's touchscreen offering provides enhanced video surveillance viewing and attractive, easy-to-use interfaces. Available in black and white. Leviton S&A is updating all existing documents to reflect the new brand of Leviton Security & Automation. While doing so, we're updating marketing and technical copy, images, and formatting. 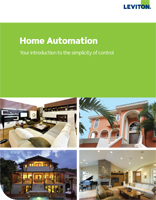 Leviton Security & Automation has updated three tech sheets for the Omni security & automation control family. Hoist Lift Truck just outfitted their 200,000 square foot manufacturing facility with Leviton Security & Automation. Commercial security system, access control, Omni-Bus lighting controls, ten thermostats, a Touchscreen, and mobile apps were retrofitted into this existing facility. Un resumen sobre cómo configurar el Traductor de Moni Bus y su configuración a los controladores de LSA. Omni-Bus Lighting Control is a DIN-Rail style solution popular in international markets as well as domestic commercial. The Manuals are now available in both English and Italian. Download the new Italian manuals here.